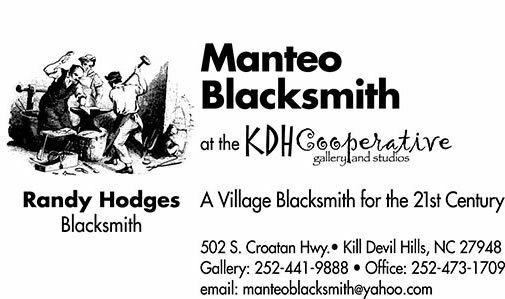 The KDH Cooperative, home of the Manteo Blacksmith, is not only a community of artists, but also of art educators. Our blacksmith shop was upgraded in spring of 2006 to meet the needs of a teaching forge. For more than 25 years one of the greatest pleasures for Randy in blacksmithing has been teaching and demonstrating the skills of the craft. 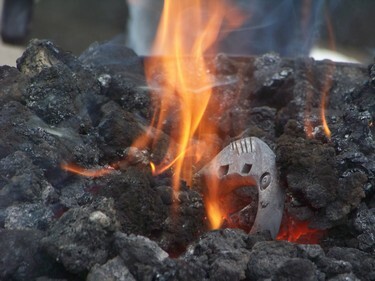 To this end the Cooperative offers a workshop – "Afternoon Apprenticeship-Introduction to Blacksmithing" – a 2 hour class which introduces the student to the practical skills and methods of traditional blacksmithing. Class times are flexible, 2 students maximum per class, available year round, pre-registration with the KDH Cooperative is required. So now you can….. If you can't make it to the beach, look for Randy at various other venues around eastern North Carolina. From time to time he does artist residencies in grade schools and teachs at community colleges and other arts organizations. 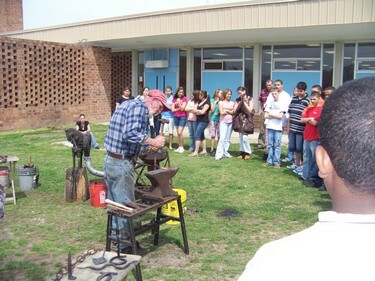 He can also provide demonstrations of blacksmithing designed for most any group or event. Have forge, will travel. Call or email for more details.